You better believe it baby. Me too. I bet my friend Cindi would be happy to lend it to you as well. Wow. You and I have a lot in common. 1. Place your eggs in a medium sized sauce pan and cover with warm water. Bring to a boil and let them boil away for about 7 minutes. 2. Cook your bacon up and drain off the grease. Let it cool down and then crumble it all up. 3. Chop up your lettuce and spinach into bite sized pieces. 4. Slice up the onions into rings. 5. Shred or dice up your Swiss cheese. 6. Peel your eggs and cut them into slices. 7. Mix it all together in a large bowl. 8. Serve with Creamy Poppy Seed Dressing. 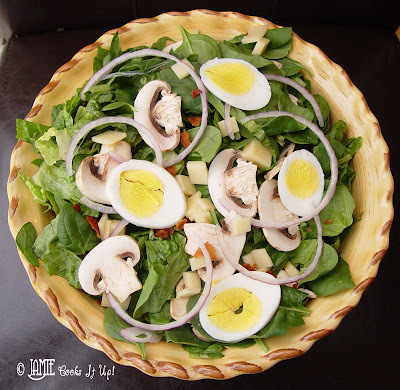 I love spinach salad and yours looks great!! thanks for sharing!! 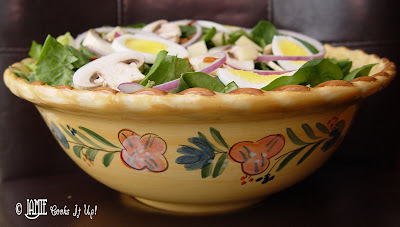 Thanks for the recipe, I love egg salad is delicious, specially with wine.